Leadership is about unlocking the potential of an organization. I'm sure this is a principle in every book written about leadership but I happened to hear it this morning coming from Republican candidate Carly Fiorina in a rebuff against Trump. Her statement triggered how I could pull together what I initially had thought were disparate subjects for a post. Throughout the nation, the energy sector was abuzz yesterday with the announcement of Kauai Island Utility Cooperative's (KIUC) dispatchable storage contract with SolarCity. David Bissell, its President and Chief Executive Officer said, "KIUC has been investigating energy storage options for more then two years and price has always been the biggest challenge." Several years ago KIUC initiated an investigation into energy storage and conducted a request for proposal for energy storage, which was concluded over a year ago. KIUC was clear about the operational objectives they wanted to achieve for the system. KIUC's review of the proposals was quick and its rejection of the proposals were reasonable and clearly articulated. Simply put, at that time it was far cheaper and more reliable for KIUC to fire-up one of their fossil fueled quick start generators than to invest in nascent technology for bulk storage. KIUC has now negotiated a contract with a price about 50% less (depending on fuel prices) than operating one of its quick start generators, and far, far less risky than making its own investment in nascent energy storage technology. Leadership at various levels at KIUC, from the Board, senior executives and engineers, to those running the daily operations of the coop are to be commended and its organizational culture recognized as strategic and analytical, flexible, adaptive and innovative. During this period of disruptive technology, leadership and an organization's cultural environment embracing strategic planning, analytics, flexibility, and adaptable innovation are key characteristics for a successful utility survival no matter what kind of ownership model. KIUC has proven time and time again that its leadership, innovation and nimbleness are key reasons why it is often cited as an industry leader. Unfortunately, Hawaiian Electric Industries (HEI), the holding company of the Hawaiian Electric Companies was slow to recognize the need for the right type of leadership for a business in transition. Although a bit late, I strongly believe HEI made a good choice in finally naming Alan Oshima as CEO of Hawaiian Electric Company (HECO) last October. Alan is familiar with disruptive technology and transformation, bringing his experience from the telecommunications sector. Now, under Alan's leadership, the HECO Companies are undergoing and is in need of huge internal reforms to navigate change. The question now is, can the HECO Companies move fast enough to survive the impacts of disruption to its evolving organizational structure and business model? Like many other sectors, the emphasis is on Big Data. As I mentioned in a previous post, as we move further away from the traditional central power design to integrating more renewable resources (both utility and customer sited systems) and unbundling and procuring other ancillary services typically provided by the utility, the utility's primary commodity shifts from electrons to data. This paradigm shift requires the utility to be the aggregator of data - that is, the analysis and management of data for the efficient delivery and usage of the cleanest and cheapest electrons while maintaining power quality and stability of the grid at affordable rates. 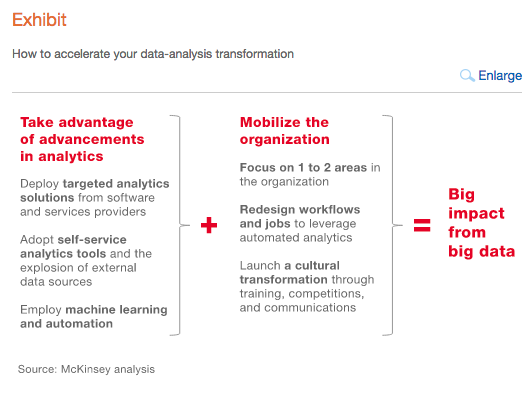 In a McKinsey & Company report about the impact of big data and advanced analytics, capturing the potential of data analytics requires a strategic business transformation. 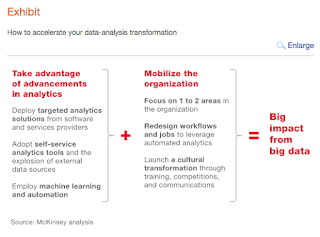 There are three elements to this transformation: (1) good planning (2) senior management capacity to really focus on data (rather than historic rules of thumb) and (3) ability to address the cultural and skill-building capacity challenges needed throughout the organization to embrace change. Therefore, the faster the HECO Companies can move away from its existing organizational process which is unable to accommodate analytics and automation with decision making protocols designed around multi-levels of approval to faster processes will determine its success in weathering disruptive influences as a public utility. Pronouncements without analysis (Governor) and new ownership models (certain politicians) do not delve into the operations of a utility - that is, addressing real issues that will lead to higher performance, customer satisfaction and, hopefully, more affordable electricity rates. This can only happen with the right leadership and workforce investment to develop the skill set necessary to directly address this electricity paradigm shift and effect the necessary organizational and cultural changes to navigate this energy sector transformation. It is these organizational and cultural changes that NextEra says it can accelerate and improve upon because of its experience. We should be paying attention and evaluating that experience rather than putting up artificial challenges and roadblocks to stymie consideration of the merger. Political leadership is also about unlocking potential and getting out of the way especially when one does not understand or is realistic about the business and technology dynamics of the energy sector. This is just another reason why we should let the Consumer Advocate and the Public Utilities Commission do their job properly and without political influence. Timing is everything and the opportunity cost will be huge if Hawaii misses the boat.